I have a very simple “audio/video” setup in my room. My main computer display doubles as my “TV” for playing videogames and watching movies. Technically speaking is just a 22″ HDTV with a bunch of input options, which I have connected to all of my devices, mostly through an HDMI hub, so I use the same screen for my computer, and my various consoles and audio/video devices. Now, I’m not an audiophile, but as you normally get to expect, its integrated speakers are kinda too terrible to actually listen to anything through them for more than 10 seconds, so I have a couple of entry-level PC speakers connected to the TV audio output, which give relatively decent sound, or at least, better than with the monitor alone. Now, as all my gaming consoles and A/V devices go to the same TV, this is a pretty centralized setup, which is great for most of what I do, and has worked really well for years, but stops being great when I want to listen to something not physically connected to my system, like my phone, laptop, tablet, or whatever. So I thought of adding a bluetooth receiver somewhere in between. 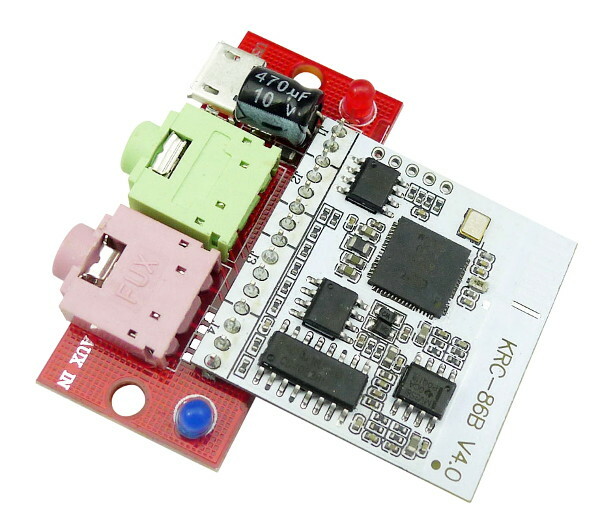 After an online search I ended up buying this nice little module, which is essentially a BT 4.0 receiver that works with 5V. 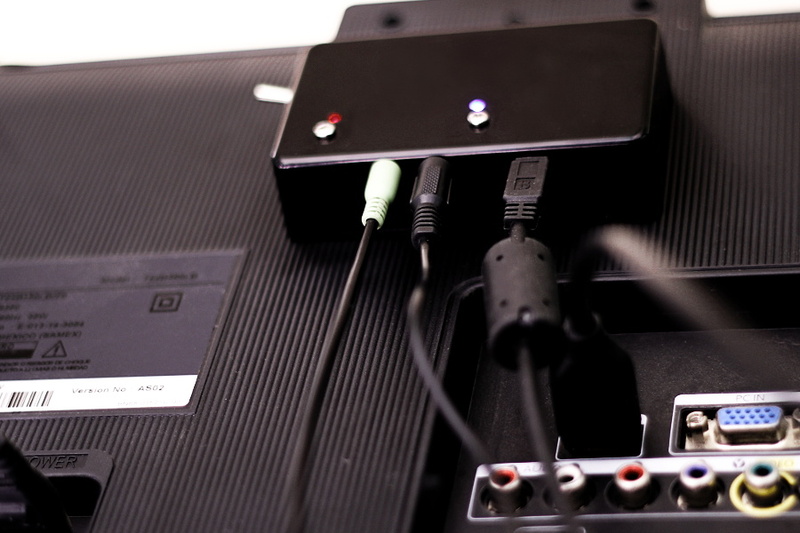 By default it will redirect whatever it receives through its physical “AUX IN” port to the output connector, but when a device connects to it over BT, it will ignore the physical input and play the audio it receives wirelessly instead. The BT Audio module. As seen on most popular auction/e-commerce sites. I plugged this module between the output of my main screen and my speakers, and used it like that for a few days. 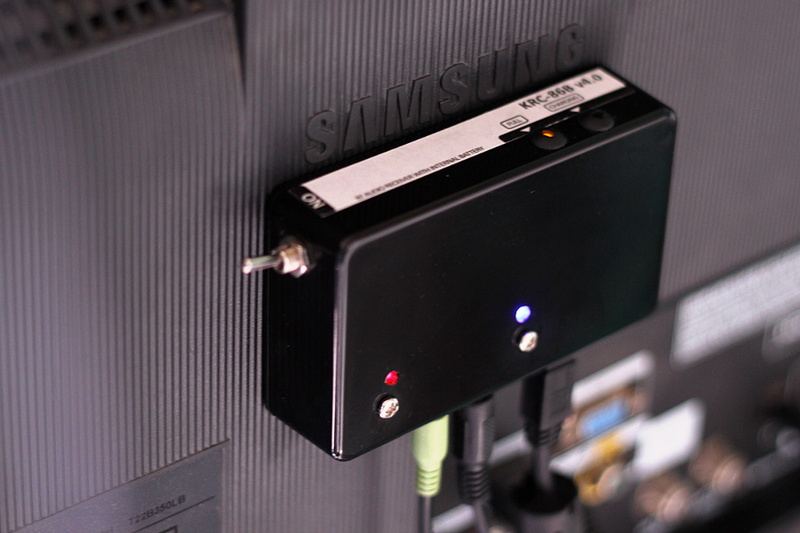 Since it requires +5V, I used the USB port from my HDTV/monitor to power the device as well. This had two disadvantages, though: The only USB port of my display was now constantly being used, AND my monitor now needed to be ON for the receiver to work, which means that even if I only want to listen to music from my phone and nothing else, I’d still need to turn my TV/monitor ON. To be fair this was already better than having to physically connect the phone to my speakers, but it could be further improved. I could have just connected the BT receiver to a +5V wall adapter and call it a day, sure, but following the success I had updating my desk clock to an improved battery-powered setup, I decided to do pretty much the same with this device; I stuffed a small Li-Po battery, a USB Li-Ion charger module, a DC-DC voltage booster, and the BT receiver module inside a small enclosure and secured the box to the back of my monitor using the wall/bracket mount holes you’d expect to find behind any TV. The BT Audio receiver in the enclosure, mounted at the back of my monitor. The DC-DC booster I used for this project is different from the one I used in my clock, because that one introduced a lot of noise in the audio line when the battery was full. I guess it’s because that booster seems to be designed for pretty low loads, and doesn’t seem to have any kind of load compensation or feedback-voltage control, so a better one had to be used here. With this setup I still have the module connected to the USB port on my monitor, but this time for charging purposes. Now I can unplug it anytime, or turn my monitor off, and the receiver will continue working, getting its power from the internal battery. 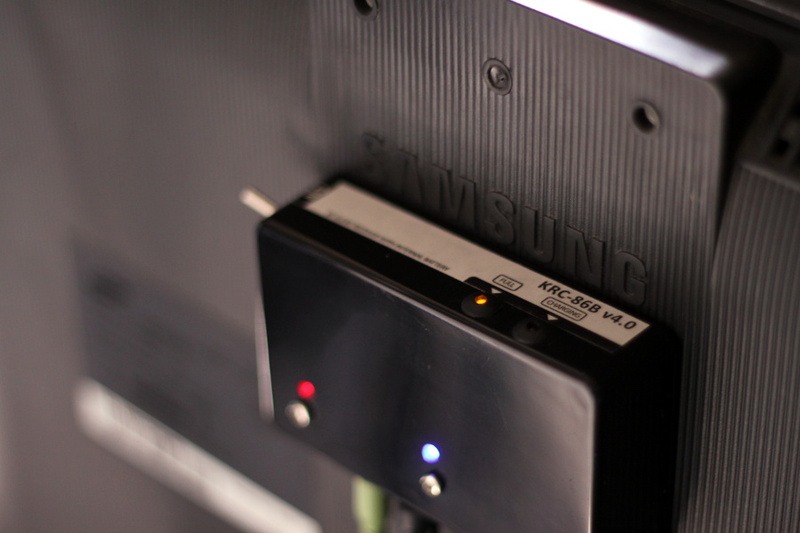 If the monitor is on, however, the module will work from the USB voltage while the battery recharges. According to my tests with a load, the capacity of the small battery I used is around 550mAh. The module draws between 20 and 80mA from the battery, depending on the battery level, and what the device is doing, but assuming a power consumption of 50mA I should get around 10 hours of standalone Bluetooth audio with the monitor OFF, which is plenty. Better view of the connections. The switch is kinda hard to miss. Also,notice how I’m using small rubber grommets as LED holders. I’m really happy with this solution. The module works great and I don’t perceive any loss in audio quality, neither from the physical input nor from the wireless reception. I tried many BT-enabled devices, and all of them were able to stream music to the module just fine. The only problem with this setup, however, is that I now need to flip yet another switch to get audio out of my rig. This doesn’t bother me much, to be honest, and it’s not a problem with the module itself, but rather with the way I decided to use it, so if you have a similar requirement I’d strongly recommend you to get this little device. This entry was posted in Electronics, Misc, Reviews and tagged audio, bluetooth, bt, krc-86b. Bookmark the permalink.